Life in the city often means sacrificing the luxury of a laundry room in favor of cheaper rent. Whether you’re looking for inspiration for your “one-day” laundry room or have one in desperate need of an update, look no further. It’s time to make your space (dream or not) one that you’ll want to show off on your next home tour. We’ve rounded up our favorite laundry room decor ideas to help you stay organized (and clean) in the most stylish way possible. Dressed up with antique collectibles, this dreamy laundry closet—home to California-based photographer, Elizabeth Messina—channels the understated elegance of a chic Parisian apartment. You know you’ve nailed the laundry room when it can compete with the rest of the home. We love that this breezy workstation bares the same floral wall covering that charms the living room. In this Scandi-meets-mid-century farmhouse, smart details like the large sliding barn door that separates the laundry room and the kitchen introduce a fresh dose of character (and function) to the home. Forget laundry day woes. Sunny yellow wallpaper and mint green cabinetry make this a happy spot to catch up on chores. This super sleek laundry room—courtesy of the creatives at Studio Life.Style—takes experimenting with accents to a new level. Matte blue cabinetry, marble backsplash, leather pulls, and an all-wood ceiling are just a few standout elements that wow. This beautiful floral wallpaper adds an elegant touch to an otherwise simple design. Bright colors and patterned tile make this small space cheery and fun. Tucked away inside an intimate nook, this ultra mod laundry unit makes the most of its tight quarters. Are we building!? Are we moving!? WHAT IS HAPPENING!??! Part 5 of the house saga is live on the blog!! When it comes to tiny spaces, color makes all the difference. Case in point: this vibrantly charming spot. Big, bold windows and an inviting bench-seat will make you want to do more than just laundry in here. Printed flooring adds visual interest to an all black and white color palette. This laundry room might be small, but it isn’t lacking design. Effective use of space keeps everything neatly tucked away. Navy blue appliances and strategically placed art make this space feel more special than a laundry room. 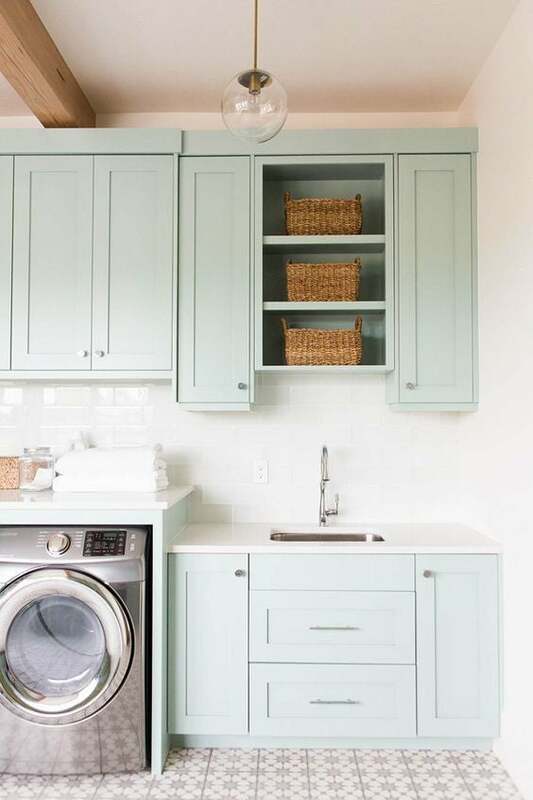 From the pastel green shade on the walls to the open shelves that promote functionality, this laundry room takes the cake for impeccable design. The muted tones and attractive storage bins make this laundry room too pretty to hide. We love the creative use of this extended entryway-turned-laundry room, complete with a wall of windows. This story was originally published on March 20, 2017. It has been updated with new information.